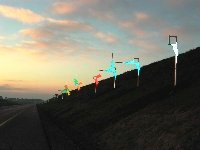 A permanent artwork has been selected for the M7, Kildare Town By Pass. The selected work ‘Race of the Black Pig’ is the work of American artist, Dan George. The work was commissioned under the Department of the Environment Per Cent for Art Scheme. This installation of two furlongs (1/4 mile) is comprised of three segments. The EAST GROUP and WEST GROUP compose of 20 aluminium posts in each group. To the passing motorist this configuration recreates the feel of the rails and fences found on the racecourse and farms in the vicinity. As the viewer passes by these posts they appear to prance or skip about in relation to each other. The CENTRE GROUP is composed of 19 aluminium elements over a distance of 100m. Their armature, or supporting structure, is developed on the form of St Bridget’s Cross and they vary from using a single arm to all four arms of this archetype. The semi-abstract quality of St Bridget’s cross serves as a transition from the abstracted rail sections to the more overt uses of imagery in the remaining 11 elements at the center of the installation. It is for each individual viewer to discover my intentions or to discover images they create from their imagination and visual associations. What they discover will enrich what I imagined. In working on this proposal I meditated on what the passing motorist/viewer might consider in relating to the land outside their windows. I remind them with imagery of the long and significant history and present life of the Curragh. e.g. The legs of horses = racing, escaping from gravity, the meta state between nature and Man’s artifice (nature/nurture), physical power, fauna; The oak leaf = Cill Dara, the power of nature, rooted, spiritual power, flora; St. Bridget’s Cross = spiritual and physical, rooted yet illustrating movement, semaphore, signifying, sign, the cardinal points, clock, time, time and direction (the four dimensions); The circle = rath, Viking shield, round tower, the wheel, the seasons, tradition, continuity, infinity, the Dionysian, The square = window in, window out, labyrinth, balance, organization, the center, stasis, the Apollonian, The wings = Pegasus, wrens, travel, escape from gravity, Daedalus. The feature is located on the motorway roadside close to Kildare Town. Dan George studied at the Arts Students League of New York and the Academie voor Schone Kunsten in Antwerp, Belgium. He is a sculptor who has worked for many years in the field of public art. In 1977 he was included in the first exhibition of the Organisation of Independent Artists on Ward Island in New York City. It was the first of his serial roadway installations in the inaugural of several exhibitions devoted to showing artworks beyond the commercial gallery or museum confines. 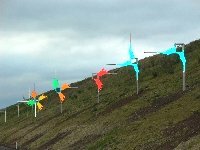 Since this time, he has completed several public art projects, many of them permanently installed throughout the USA, including Boston, New York and Philadelphia. 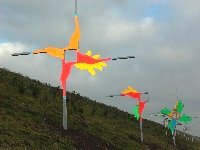 Wexford County Council recently commissioned Dan George to create a permanent art work ‘Passage of Time’ for the N25 Realignment Project. His work is represented in leading public and private collections.